#NodeInspector If you like to use scriptable object as config files you probably know how hard is maintain references from one object to another. This project would help you to organize your objects. #Graph Graph is a set of nodes connected by references. In our case we have ScriptableObject as a graph nodes. To start work what we need is to define Graph scriptable object which will keep links to all nodes. and all nodes just need to be inherited from ScriptableObjectNode class. If you open this class you will find that it just have one more property WindowRect. this property used in inspector to store information about node position. #MyConfig.cs I’ll create test class which will keep some properties and have a link to another object. As you see it’s really simple class you just keep some properties here. you can use several graphs at one scriptable object. but you graph must be a List of ScriptableObjectNode type or classes deprived from it. 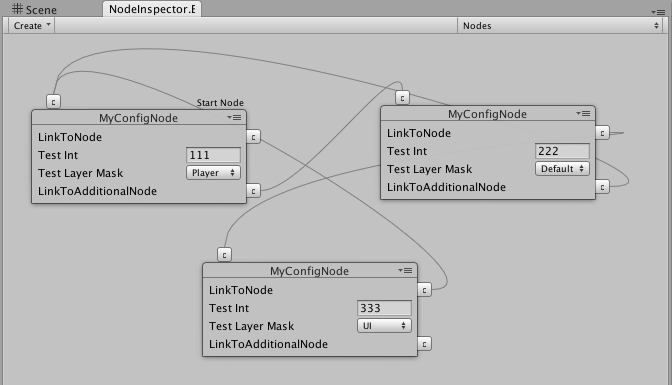 At the top left corner of the inspector you will find menu which create instances of your node. This is it. now you can freely connect your nodes as you wish. and if you want to create some node as start node just use context menu or toplight menu of the nodes.